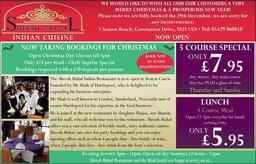 The Sheesh Mahal Indian Resturant Is A Family Business. 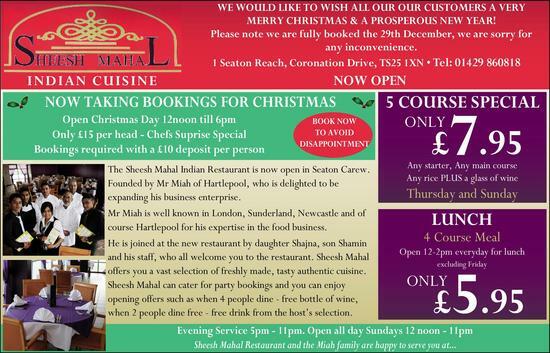 Owner, Mr Miah, Is Well Known For His Quality And The Standard Of Food In London, Newcastle, Sunderland And Hartlepool. Mr Miah Said "It Is Not Only About Just Providing Quality Food And Good Service, It's About Making Friends And Making Our Customers Happy And Putting A Smile On Their Face" The Sheesh Mahal Can Cater For Parties Such As Weddings, Birthdays, Family Days Out, Meetings ect. The Sheesh Mahal Can Take 100+ seatings.